Feast your eyes on the most amazing comfort food of all time- smothered pork chops! I love to serve this with mashed potatoes- either on the side or on top of them. So good! I am going to show you how to use a programmable slow cooker to create this meal, cooking all day long for the perfect pork chops. 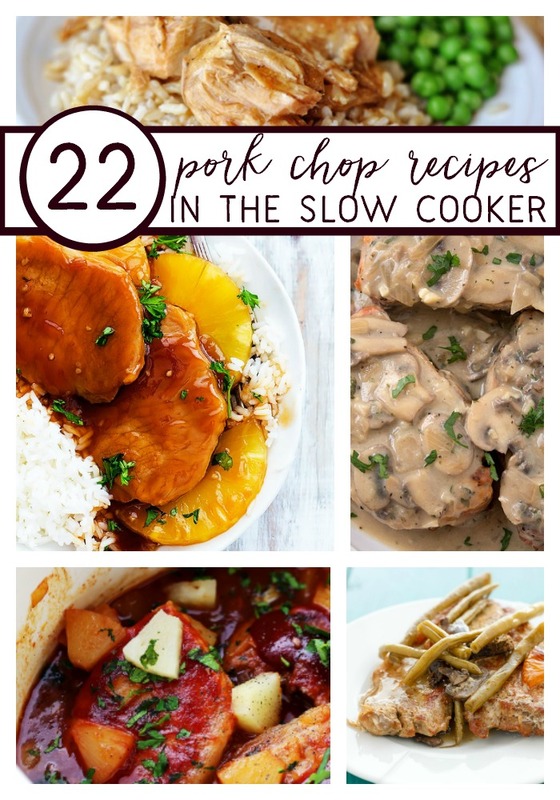 Check out our favorite slow cooker pork chops while you’re here. They are all easy and perfect for large families. The other wonderful feature of using a slow cooker is, once it’s done, you can move it to the warm setting (it will automatically do this if you use a programmable one) so that dinner stays warm until you are ready to serve it to your family. Let me show you how super easy this is to make. I made this last night for Grandpa Lopez’s 80th birthday. I asked him last week what he wanted for dinner. He said pork chops. When I asked him what kind of pork chops he did not reply. So, smothered it is. And they were a hit! I actually ended up having two slow cookers going at the same time because I needed to double recipe since we were feeding a crowd. Man is it nice to have two slow cookers going at once cooking 16 pork chops total. I likely could have cooked all 16 in one slow cooker, but I was in a time crunch and did not want to compromise cooking time. 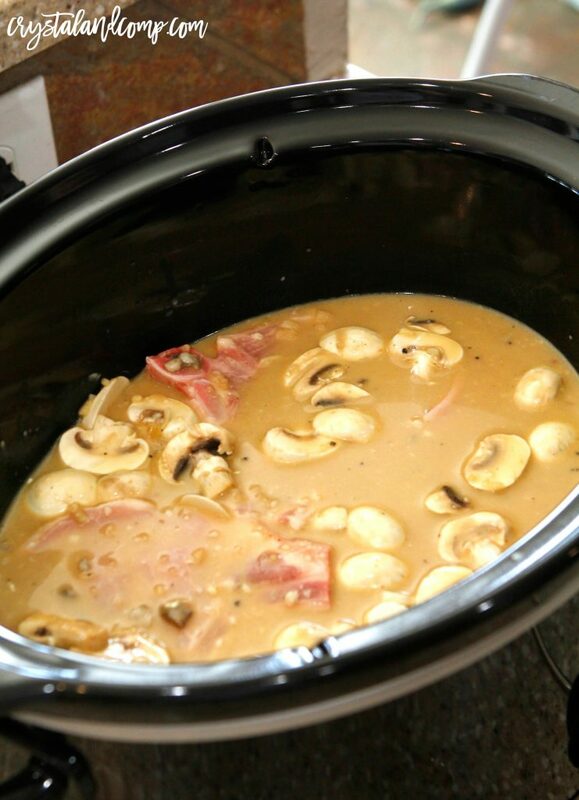 Remember, the fuller your slow cooker is, the longer it will take to cook something. And, the less full your slow cooker is, the more likely it is to dry out your meat or over cook it. These slow cooker tips are super helpful to take a look at before cooking your next slow cooker meal. If you are more of a visual recipe learner, or love to see a mom in the kitchen with chaos and kids, you can watch how we made this recipe step by step. Add the pork chops to the slow cooker base. In a large mixing bowl mix together the broth, gravy packet, can of soup, soup mix packet, garlic and pepper. I like to use a whisk. Pour this evenly over the pork chops in the slow cooker. Add mushroom slices over the soup mixture. Ensure everything is evenly coated. Look at how amazing that is! Then, I want you to pour in the corn starch and water mixture. This will help thicken up the sauce a bit so it is more gravy like, which we love for our mashed potatoes! Cook on high heat for 5-6 hours. Cook on low for 8-10 hours. Adjust accordingly if you’re doubling the batch or using thick pork chops. Move it to warm once it’s done, or until the rest of your sides are ready. Like I said before, you can serve the pork chop right on top of the mashed potatoes. If you pork chops fall off the bone while cooking (and this can happen because they get so tender, which is good!) you can serve the browned bits of pork chops and gravy over a pile of potatoes like we did here. I hope you enjoy this smothered pork chops recipe. It was a huge hit at our house. We served it with mashed potatoes (I seriously love instant mashed potatoes right now!) dinner rolls, salad and broccoli. You can also choose to cook this in the oven in a cast iron skillet or in a 9×13 casserole dish. You could even cook it on the stove top in a skillet over medium high heat. If you do the stove top method, wait until it is done cooking to add the water and corn starch. Reduce the heat and add allowing it to simmer until the gravy thickens. Do you struggle with getting dinner on the table? I encourage you to join our Facebook group Get Dinner on the Table or check out my ebook How to Meal Plan. Cook on high heat for 5-6 hours. Cook on low for 8-10 hours. Adjust accordingly if you're doubling the batch or using thick pork chops. Move it to warm once it's done, or until the rest of your sides are ready. If you guys know me you know I like easy recipes. I do not want to spend hours in the kitchen over a hot stove. I don’t want to whip up meals that have a ton of ingredients. Simplicity….that is the key. So with that being said you know my Crockpot and I have a very close relationship. I can get dinner on the table easy peasy with the use of the absolute best kitchen tool there is! If you are a pork chop lover you will be amazed at the tastiness these recipes have to offer. 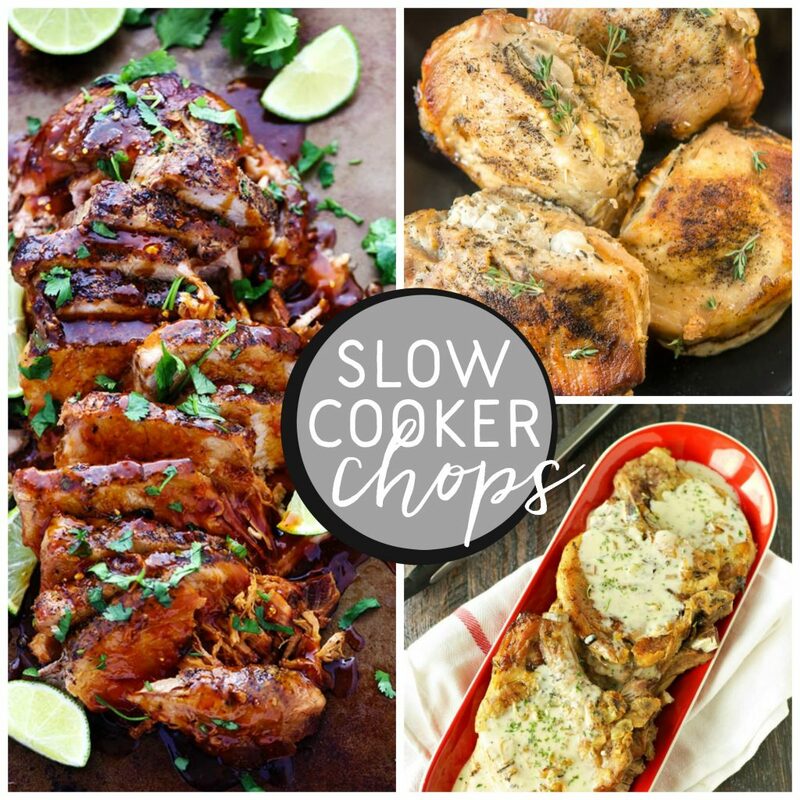 So, seriously relax over the thought of cooking dinner tonight and please your crowd with these delicious and savory slow cooker porch chops! 1. Love apple butter? 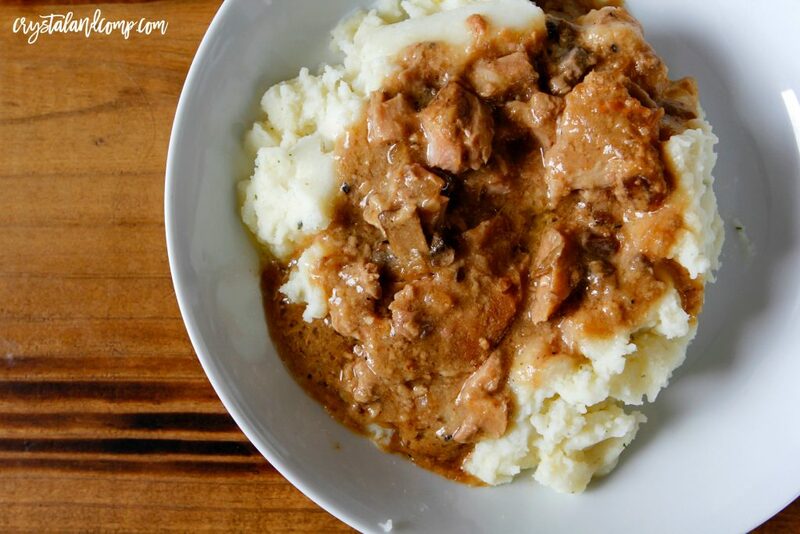 You have to try this slow cooker apple butter pork chop recipe! 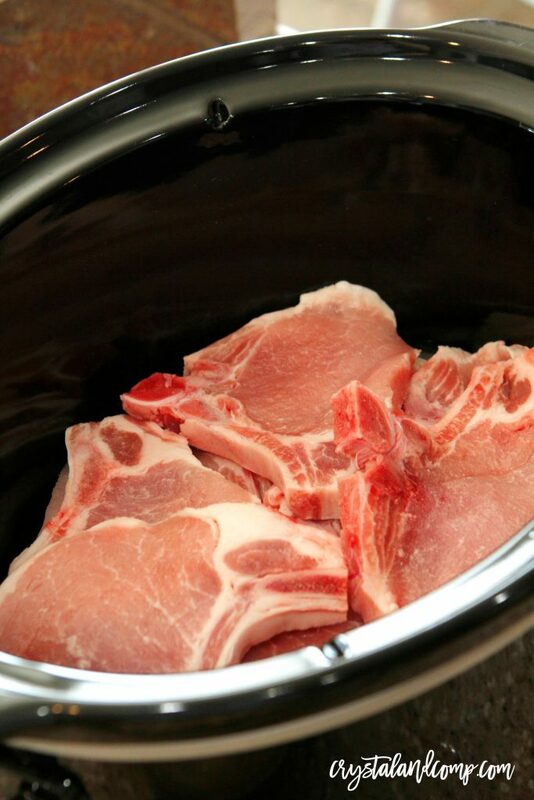 Crystal & Co.
How are your preparing pork chops in your crockpot? Share your best ideas!